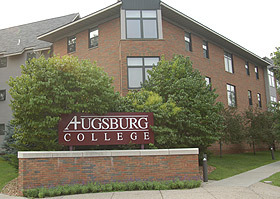 At last Saturday’s board meeting, the Augsburg College Board of Regents approved the naming of what had been known as New Hall to the Martin Luther Residence Hall (or Luther Hall for short). The new name is effective immediately. Luther Hall was completed in 1999 and was funded with state higher education facilities bonds. Since there was no single outstanding donor behind the project, the building was simply referred to as the “new” hall until receiving an official name this year. According to the document ratified by the Regents, there are several reasons why this naming was needed. The residence hall is no longer the newest hall on campus, and its lack of a clear identity might confuse prospective students. Also, Augsburg seeks to celebrate its links to the Lutheran tradition, and this name is another clear symbol of those links. The naming of Luther Hall provides a fundamental statement of Augsburg's heritage and its continuing mission-based commitment to the Lutheran and Christian faith that embraces a diverse world.